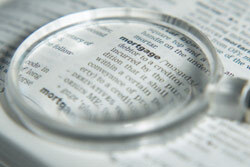 Are you looking for a mortgage loan? We'd be thrilled to talk about our many mortgage solutions! Call us at 760-752-4480. Want to get started? Apply Online Now. With a reverse mortgage (sometimes called a home equity conversion loan), borrowers of a certain age may use home equity for anything they need without selling their homes. The lending institution gives you money based on your home equity amount; you get a one-time amount, a monthly payment or a line of credit. Repayment isn't necessary until the homeowner puts his home up for sale, moves (such as into a retirement community) or passes away. After your home has been sold or is no longer used as your primary residence, you (or your estate) must pay back the lending institution for the money you obtained from the reverse mortgage in addition to interest and other fees. Typically, reverse mortgages require you be at least 62 years of age, have a small or zero balance owed against your home and use the home as your main living place. Reverse mortgages are great for homeowners who are retired or no longer bringing home a paycheck and need to add to their income. Social Security and Medicare benefits can't be affected; and the money is not taxable. Reverse Mortgages can have adjustable or fixed rates. Your home can never be in danger of being taken away from you by the lending institution or sold against your will if you live longer than your loan term - even if the property value creeps below the loan balance. Contact us at 760-752-4480 if you would like to explore the benefits of reverse mortgages. VanDyk Mortgage offers a full line of Reverse Mortgage Options to help Seniors. We are saddened by Friday's closure of IndyMac Bank and their Subsidiary, Financial Freedom by the US Government, however it has not reduced our product offerings. We have multiple investors to assist you in getting the best options for your retirement planning. At VanDyk Mortgage, we answer questions about reverse mortgages every day. Call us: 760-752-4480.